Brendan is the author of numerous books but I brought Brendan on the show to pick his brain about one of my favourite books and one that I often recommend to other traders – “What I Learned Losing a Million Dollars“. 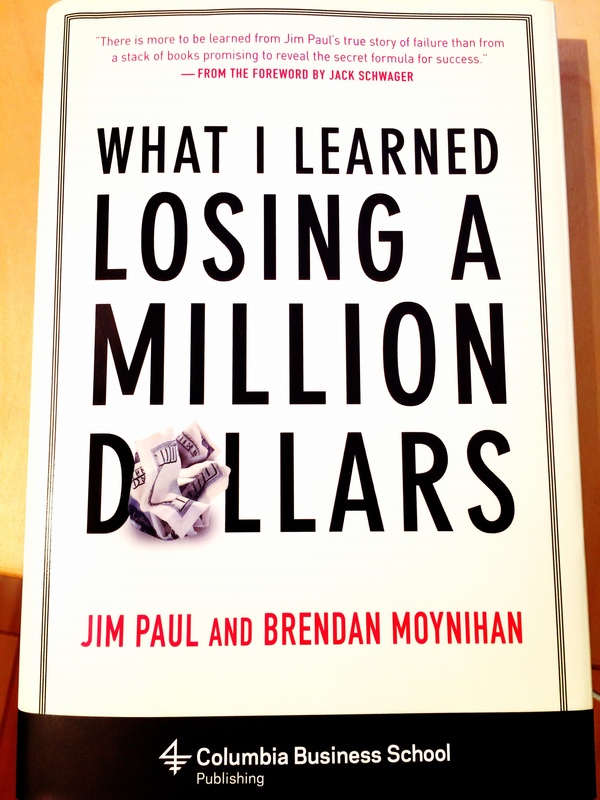 What I Learned Losing a Million Dollars was originally published in 1994 and recounts the story of Jim Paul’s meteoric rise and crash. The story alone is worth the read however the lessons you will find in the second half of the book turns the book from a simple biography into a powerful and timeless parable. The book is filled with quotables and great ideas and I think you’ll find it worthy to add to your trading library. Emotionalism – letting your emotions steer your decision making. [36:50] – Are you disciplined or do you need discipline inflicted? The moral of the story is: Success can be built upon repeated failures when the failures aren’t taken personally; likewise, failure can be built upon repeated successes when the successes are taken personally. [00:06]Houston: Absolutely, thank you for joining the show, so before we get started today. I just wanna tell everyone that Brendan is the author of numerous books but I brought Brendan on the show because I wanted to talk to him about one of my favorite trading books and it’s a book that I often recommend to other traders called What I Learnt Losing A Million Dollars and Brendan I know you probably heard it before but what a great title so what’s the story behind the title? [06:54]Houston: What a great story, sobefore I get much deeper, why don’t you tell a little bit about your background so, it sounds like before you met Jim and you start writing the book you were a trader and then you became an author shortly thereafter. But yeah, tell us a little bit more about your story– how you got started with trading and your background. [07:15]Brendan: Yeah, well I, in college I knew what I wanted to do, I knew I wanted to trade and I wanted to trade bonds. And I came out of college and I did get a job in Nashville working on a cash bond desk for about a year but I also knew that I really wanted to be in Chicago or in New York for at least a little while early on in my career. So I was very interested in futures and so I went to Chicago and I worked up there as a research analyst for a couple of years then a went out on my own started trading on my own and I did that a while, then I picked up a job with Jim being an analyst for them in foreign exchange and that’s how I got to know them and then like I said the firm that I worked with in Nashville recruited me back and that’s when I left and I worked with them and he told me about the story and everything. So I went back down there and I worked with binds for about five years then I went across the street and did currencies for about two and a half and September 17, 1997 I quit and went home, because I wanted to be around to help raise my two boys by then five and eight. And I had about four or five research clients that I had wrote research for in different fields: stock, bonds, currencies, commodities and I just worked out of my house for about fifteen years and I worked in (inaudible[08:36]) the stocks had been going up. [08:43]Brendan: And one of the clients was Bloomberg so I’d been publishing for Bloomberg News for a longtime and I’m still a consultant there. I mean that’s fifteen years, I started March of 2000 so. Yeah so I mean (inaudible[08:57]) qualified me to write the book in the first place was that I had been the market and have had my series of losses. And when I finished the book and gave it to Jim and he read it. He was very full of himself just in general, but he said “you have to know my story, because how would you know about these losses stuff” and I’d say you’re so vain, you’re so vain; you think you are the only person who has ever lost money trading. I said look I may not have lost a million dollars in 75 days but you know what it doesn’t matter, if I lose five grand or ten grand or fifteen grand in a trade, it’s the same process you just choose to be monumental about it. I mean I did it in small proportions you did it in biblical proportions but it’s the same thing. [09:37]Houston: And it sounds like Jim Paul is a larger than life character is that a fair characterization? [10:47]Houston: So I think the next step is to have a movie made, I think that’s next. [10:52]Brendan: Yeah, I’ve got somebody in mind for that but I own all the rights to it though; I did, I did, I’ve got a son in Los Angeles and I kind of just got out of college and that’s the industry he wants to be in so we might wind up doing that. [11:07]Houston: That’ll be great I’d definitely buy tickets to that. So let’s just quickly shift this for a second talking about the book again. You know as I was telling Brendan before the call, I came across your book when I heard you on Tim Ferriss’ podcast last year. Then I received your book as a part of Tim Ferriss’ quarterly box and what I was saying is that this book was first published back in 1994 and it kind of blows my mind that we are still talking about it today and it kind of speaks to the timelessness of the subject matter and of your writing. So how does it feel to still be talking about this, this title, this book? Because you have talked about this dozens of times. [16:57]Houston: Yeah, what a great back story, so let us talk about the books, the book is just filled with quotable and great ideas and you have already take about the big one. So the three mistakes that investors make you teased that already, so what are those three mistakes? [17:15]Brendan: I am not going to tell anybody they have to go and buy the book. No I am kidding, I am kidding ([17:17]Houston: inaudible). So what happen was I mean I do think, I believe that I have identified the three things that I have done wrong you know, repeatedly and I talk to other traders and you know I kind of dance around it and say hey I am going to research for a book you know but I kind of heard them saying the same thing. So it was sometime into writing the book that I ran across, I don’t know what prompted me to do it but I said basically this is a life (inaudible[17:42]) on the psychology of trading, so I look at the definition of Psychology in the Dictionary and it says “it is the study of the mental processes, behaviors, characteristics and emotions of an individual or group, “ I’m like those are the three things that I have been writing about, so Chapter Six is about the mental processes, Seven is about the behaviors and characteristics. I have already written it, I just kind of (inaudible[18:05]) the definition and just unpacked it and just labeled the chapters that way because that is exactly what it is, so basically the mental processes or internalizing what should be an external loss. When you lose your keys you know you don’t go into a deep funk right, it is an external loss you find them right? An internal loss is the loss of a loved one, a parent, an uncle, a grandmother, dies or whatever. These are internal losses and in that people go through five stages of internal loss, which I have labeled it internal loss the five stages come from a book called On Death and Dying by Elizabeth Kubler-Ross in which she interviewed two hundred patients who were terminally ill to find out if are a common thread and this is where you may have seen in other writings whatever denial, anger, bargaining, depression, acceptance that is right, so the exact same thing happens when you suffer an internal loss whether it is you getting ready to lose your life or you lose a love one to death like denial, then anger, then bargaining, then depression and then you finally accept it. The same thing in the market right. You lose your money, denial (really? ), you see and opening quote in the market (really?). I was in (inaudible[19:27]) one time July 23, 1988 the beans opened at $1.9, is this a bad quote? Is something wrong here? I mean, it was like there is something, 1094 which is 109 and a half (inaudible[19:40]) like something is wrong here right, no no. [25:00]Houston: That’ll be a clever spin, I like that. [25:16]Houston: it’s kind of what Disney does every year with their big titles. Like Bambi comes out every twenty five years or what not ([25:21]Brendan: yeah). So back to the mistakes: so number one is internalizing an external loss, number two is kind of confusing what type of participant you are. [25:31]Brendan: (inaudible[25:31]) so to deal with emotions, so if you were to ask most people: what are the two driving emotions in the market? They will typically say fear and greed. Well I disagree with that, first of all I’ll give you the reasons. First of all emotions are neither good nor bad – they just are. They happen right, your dog dies I guess you’ll feel sad; I mean these things just happen – you feel happy you feel sad, whatever. Decision making based on emotions that I can but a value judgement on, that’s not good. Experiencing emotions is fine, it’s that decision making under that rubric that’s the problem. So, I think that rather than like trying to deal with all, you now there are lots of books out there on oh you are this way because your mother didn’t kiss you goodnight when you were six years old. I can’t do any of that, I’m not qualified to do that, I majored in Finance and that’s what I do. But what I can say is that if you really look at it, it’s not fear and greed that are the driving emotions on the market. It’s hope and fear – our natural responses to the uncertainty in the future – which is the markets and is the topic of the next book that I am currently researching on right now. Our natural responses to that are hope and fear, hope things are going to turn out well and a fear they won’t ([27:04]Houston: Right) the paradox is this: we experience both of those simultaneously and whichever one is dominant dictates what your action is going to be. So for example, if you are long and the market is going up you are going to hope it keeps going and you fear it won’t. If fear and greed were really the driving emotions, greed means wanting excessive amounts of something so, if you are on the market and things are going up and down, if you were greedy you would get out, get short and make more money so it’s not greed otherwise you’d do that. It’s hope and fear so if you’re long and the market and is going up you are going to hope it keeps going, you fear it won’t which ever one is dominant will dictate whether you stay in or get out. So let’s say you are fearful, it’s not gonna keep going up and you get out now do you know what you feel? You hope it’s going to keep going down to make you look right and you fear it’s going to go back up. That’s just one variation, now you can imagine flipping around and being short same thing or not being in the market watching it go up, hoping it will go up, hoping it will pull back fearing it won’t whichever one dominates will dictate what you do. It is a constant tussle back and forth between those two emotions that dictates what we do and making decisions based on that is what I’m saying is a bad thing. (inaudible[28:32]) Making decisions based on that is the problem. [28:43]Houston: Yes, a real tug-o-war between hope and fear. And that’s a classic example of you trying to get filled on a pullback, you get filled and now you’re hoping doesn’t go much further down as you’ve gotten filled already. [29:01]Brendan: (inaudible[29:01]) Then you hope it starts going up but you’re afraid it won’t (inaudible[29:04]) and you turn on a dime, you know, it’s like being manic depressive. [29:15]Houston: Absolutely, absolutely. So in the book you talk about one way to deal with some of these emotions and I think you called it emotionalism in your trading, I think there are several layers here but is number one you talked about treating trading like a game; So why do you say that? [31:05] Houston: Yeah, well said and putting that structure on top of this continuous process that never really ends is gonna basically turn into a discreet process that you can better manage versus just having it run around forever. [31:20] Houston: And so how does it layer then into having a trade plan, is that trade plan exactly (inaudible[31:26]) some structure? [32:03] Brendan: And then you get in the market. It’s like, OK, at this level it’s either I don’t have enough money to go beyond that or I’ve created enough technical damage or it violates rules three, four and seven of my system or whatever. It happens and I think writing it out and I think literally if you get it, if you objectify it, you’re a lot more likely to follow your ideas if you’ve written it out ahead of time and out it down on paper and just don’t deviate from it the moment the position is there; if you get knocked out, you get knocked out four times in a row, if there’s something wrong with your system figure it out when you’re not in the market but don’t try to move or change things in there because the (inaudible[32:47]) takes over and you just make it worse. [42:43] Brendan: I think that, that’s, I mean that in chapter six is connected to how does an external loss becomes an internal loss. What happens that converts a loss of money into denial, anger, bargaining dah, dah, dah? And I think that a lot of it extends from the condition we get in school and we “lose points” for wrong answers. You don’t get a test and have to put in, the teacher doesn’t say plus two on this, plus three on that, plus nine, no everything is just subtraction. You get the blank test and it’s worth a hundred, right? [43:30]Brendan: You turn that thing around and there aren’t any answers yet, you turn it back in and the teacher is up there knocking points off, so we lose points for wrong answers. When we lose money we think we must be wrong and none of us wants to be wrong ([43:44]Houston: right) we want to be right, so very often we are betters in the market in a continuous process rather than a discreet event, gains where it is okay to do that. And this gets us into trouble; so we don’t want to be wrong and this is a confusion between self-worth and net worth. People are more often interested in the gold stars of being right and the gold money of actually making money in trading. So I do think people could use those two and to the end you did it and the upside too, your self-worth is up on a 1.2, 1.3 million dollar trading account (inaudible[44:28]) and lost more than that ([44:45]Houston: inaudible). I mean at the end of the day he was like worth minus four hundred. [44:43]Houston: So how do you disconnect that? Do you have any ideas on how do you disconnect that? It seems like it is so tied together naturally. [44:48]Brendan: What I hope is happening is that by unpacking it, a lot of people think about it that way, I mean I hadn’t read about it presented that way before and again it’s almost like an expose, like I’m saying these are some really important things to think about and some things to monitor in your own behaviour and thinking to see if you’re succumbing to the psychological mistakes. You need to do something to step back so that when you lose money, you lose because of your methodology not because of your stupidity. You want to try to bullet proof – to the extent you can – your methodology without tainting it with your head; so to find out if you are doing that these are some things to observe in yourself when doing that right: if you find yourself bragging about the size of your trading account ding, ding, ding, ding, ding, ding, hello (inaudible[45:52]) how much money you made it’s none of their business; and they may not have even asked you. [46:01]Houston: Exactly, you’re volunteering the information. [46:04]Brendan: Oh hi my name is Brendan; I made five thousand dollars trading commodities yesterday. I mean they don’t care and unless you are trying to impress them in which case you need to be doing it in some other way, you know, I mean. [46:27]Brendan: Yes, you know it’s not a bad idea and having that again but like writing it down, and I mean even theoretically just talking about it right now you make your check list you use it each day and then it’s like okay, here’s what I’m supposed to do and here’s what I’m not supposed to do. And like draw a line for the ones I don’t know like circle the ones you’ve failed on and say how, it’s discipline if I am I’m sticking to it is that the method for doing it. Type it up on a computer and print out fifty copies of it (inaudible[46:55]). Did I do this? Did I do that? And if you find yourself calling up your friends and saying “hey I’m making a lot of money.” you need to stop doing that, okay. [47:16]Houston: I’m guilty of saying, I was reflecting that. My wife knows I’m trading well I’m definitely guilty of saying hey honey (inaudible[47:26]). That’s usually right off the top when the bell rings. It’s great, so I know we’re getting close to the end of the hour and wanna make sure that I honour your time today Brendan. But is there is a concept that I definitely want to unpack: we talk about how traders often tend to act like the crowd and we find have that we have the crowd mentality. [47:59]Brendan: Yes, so that is in chapter eight and it’s the emotional and the, the quintessential example of emotional decision making is the crowd. And I went back to Lebons “The Crowd” from 1905 which is you know I’m sure in the traders library. You know we were advertising various books and some of the examples used in there to identify what are the traits of a crowd, but the sort of readers digest version of it is kind of going to pop into it right now is that I believe that if you exhibit, you can exhibit these traits of affirmation, repetition, prestige, and contagion like (inaudible[48:45]). You are in an echo chamber, to call your best friend and say hey what do you think of this and they say yea I think it’s looking good you can talk yourself through self talk or you can talk in the isolation of you own trading room – in your den -trading over a computer; you don’t have to be around a whole bunch of other people to behave like the crowd does and get that sense of invincibility. You can do it if you exhibit those traits, you can do it in the privacy of your own home as an isolated individual ([49:16]Houston: right) and the crowd is emotional decision making, it is what causes people to you know they win a national championship so they burn police cars, it is because they have protection, things that they would never do on their own they will do under the cover of other people been there with them. I see in the markets you can find yourself what I call making a crowd trade, is that you are held in a rapt state of attention, you may have just lost some money, you looking for the next best opportunity, a tip comes along, you hear this and bam you are off the chair and going to doing it but it is outside the parameters of the trade plan, it is outside the parameters of whatever you know, your system, your methodology is and what is does is. If you marry those kinds of crowd behaviors with our natural response to the uncertain future which is hope and fear, you can create personal manias and panics. A mania grabs a whole group of people and make them go nuts, right; it can be in the market, it can be setting police cars on fire after championship or whatever, it is manic okay, that is hope plus crowd behavior right. And then fear plus crowd behavior is a panic, so I think that you can sit in the privacy of your own room and you can match crowd behavior with hope and have a personal mania and you can marry crowd behavior with fear and have a personal panic and there is nobody sitting the room with you at all your in there by yourself doing this and that is another way that these feed on each other, they are not compartmentalized. It’s a dangerous cocktail. [51:58]Houston: Yeah, powerful; so maybe just a couple of quick fire questions and then I will let you share where people can find out more about your work, but I heard you say in other interviews and I just wanted to (inaudible[52:09]) because I thought it was curious. You said that good traders or successful people have a healthy disrespect for money, I love that one ([52:18]Brendan: Yeah). What do you mean by that? [53:46]Houston: Yeah, that is a powerful piece of advice and what I see and what I know is that we often as traders as well – any trader comes in the game with the scarcity, they won’t be successful because that mind set will only bring more scarcity ([54:00]Brendan: right), so (inaudible[54:03]) call this way I just want tell everyone again that again, pick up Brendan’s book it is a great book – if you have never read it – it’s a great title and as you said before I heard you talk about the same time is that I think this is a really great book to pair with some of those other books, so the books about how to make money, so you rarely have some of those books about how to make thousands and millions dollars and that is great but this book takes it from the other angle right, so you are inverting that and approaching it from how it is to lose money. So thank you Brendan for your time today. Where can people find out more about you and your work if they want to find out more?